Real Music’s “Namasté” series was created to present listeners with music for better well-being and spiritual exploration. 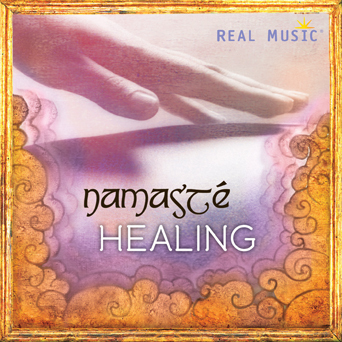 With Namasté Healing, the focus is on softer music that has a meditative feel to it, providing an ideal backdrop for any and all healing activities you embark on. The album starts with the sublime synthesizer fantasias of Liquid Mind — a light and lulling introduction to the set. Kevin Kern’s piano playing, here represented with “And the Light is Forever,” is emotional and sweet, helping to build the tranquility level as the album progresses to its middle. The roster includes many of Real Music’s best relaxation-themed artists (Peter Kater, 2002, Bernward Koch, Kenio Fuke, etc.) which together provide a tapestry of healing with sublime Asian accents. The Asian flavors are particularly noteworthy on later tracks by flutist Rajendra Teredesai and flute/vocal duo Sacred Earth. This is a wonderful atmosphere album for anyone looking for stress relief and music for meditation.